Hunting for turkey is not so much different than hunting other game in the woods, but one difference might be the size. To be able to hit such a small target, it is of utmost importance to pattern the shotgun. Not balancing and zeroing the shotgun might keep a hunter from being able to hit that turkey. There are a few materials available that might help to pattern your shotgun for hunting turkeys. For example, many of the better hunting and sports stores offer turkey targets. 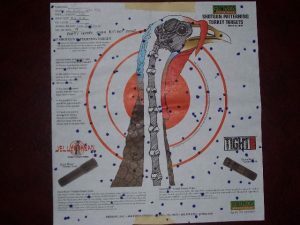 If a commercially produced target is not preferred, a hunter may draw roughly the size of a turkey’s head on a paper and pin this paper to the usual target used to train. To properly pattern a gun, targets need to be set up about every ten yards starting at twenty. This means 20 yards from the shooter, 30, 40 and then five yards distance for any targets after the 40 yards one. When shooting at the targets, try out different types and even different brands of ammunition, since most shotguns and rifles have different accuracy levels with different loads. If the hunter is lucky he has one of the few shotguns that is very accurate and there will not be much pattern work necessary. After setting up the targets, the hunter needs to aim at the turkey head. By shooting the head, he will learn several things about the gun (given of course that the shooter is a good shooter). First of all the hunter will learn from his shot pattern, where he has to aim at with the bead of the shotgun to be able to center his shooting pattern on the turkeys head. It will show if the gun is dead on, or maybe a tad bit high or low. As mentioned before, the hunter should try out different loads, so that he can learn which load gives him the best, most accurate pattern. It is also important to make sure that shots are fired at the further away targets. This will give the hunter his effective range and the maximum at which the hunter can consistently hit the turkey head with this shotgun. To be able to determine this, the hunter needs to have at least four if not five or more shots strike the turkey head. Patterning a shotgun properly takes some time, but it is time well spent. The more accurate a gun can be shot, the more game the hunter might take home. While if the hunter has to guess where to aim to hit the animal, he for sure will miss a target as small as a turkeys head. For newbies to the hunting and turkey hunting sport, many hunting books, online pages and even employees at the local shooting range should be able to help. By the way, before going out there and try to pattern a gun in the backyard, make sure that it is allowed to shoot a gun in the backyard. Many states have laws that do not allow for the use of guns within city limits, especially in big suburban neighborhoods. If patterning the gun is still necessary within city limits, the hunter can go to the nearest shooting range and do it there. It is also important that the hunter does not pattern his shotgun too much ahead of time. Time and even usage can change what the hunter has learned from his gun and therefore, patterning it just before the trip is the better choice. So, before planning the next turkey hunting trip, it is important to check the gear for completeness and to make sure everything is packed. It is also essential to pattern the gun. The better the gun is zeroed, the better for the hunter, because the hunter can more rely on his skill than on good luck for aiming.